The intention of the Golden Binder was, and is, to ensure that everyone has the same information about support for our children, and that everyone has ownership. That includes parents and young people, as well as service providers, the SEN Team, Schools, Health and Social Care. Every six months, the process governance group – with representatives from all the above – meet to make considered, collective changes. 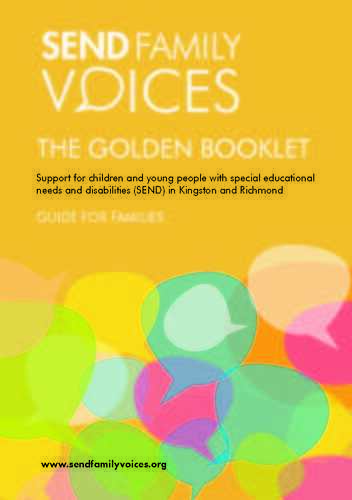 We are delighted that we have managed to produce the Golden Booklet in the same way. Therefore, there is co-ownership! It’s a booklet – and it’s accurate (prizes to anyone who spots a typo). Right now, the booklet is at the printers, and we will be sending printed copies to all families of children and young people with either a Statement of SEN, or Education, Health and Care Plan. Accompanying this, will be a letter with details of our events this summer term. And we must say a loud Thank You to Penny Hoffmann-Becking (SFV’s EHCP Lead) for leading this work on family’s behalf.